You would think by now I would have had enough of ridiculous grinds. The above conclusively proves, if it were needed, that I love a stupid task. If it involves a) skinning and b) the same route to kill mobs over and over again then so much the better. 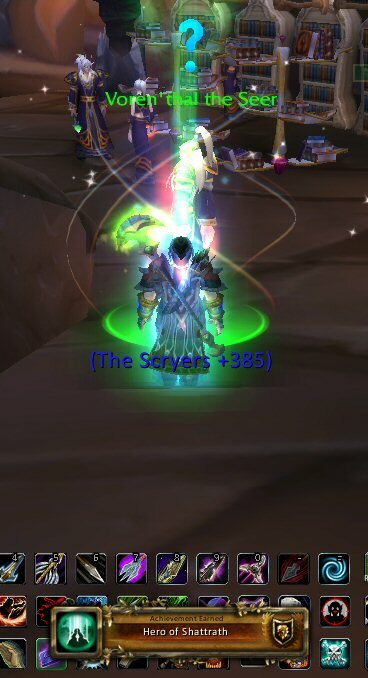 To get from Exalted with the Aldor to Exalted with the Scryers required 1224 Dampscale Basilisk Eyes (only a 40% drop from the mobs in Terrokar Forest) as a handin. Let’s face it, giving in the eyes and then the Scryer reputation items was as much of a trial as the grind. In the end however it took just over a week, and wasn’t entirely without an element of profit. Knothide Leather’s up to 45g a stack on the server, and the greens that dropped (and even a blue) were either sold or sharded for sale. All in all, it was worth the faff. Yes, it was.